In the opinion of oddsmakers, Canelo Alvarez should fear a fight with Gennady Golovkin. 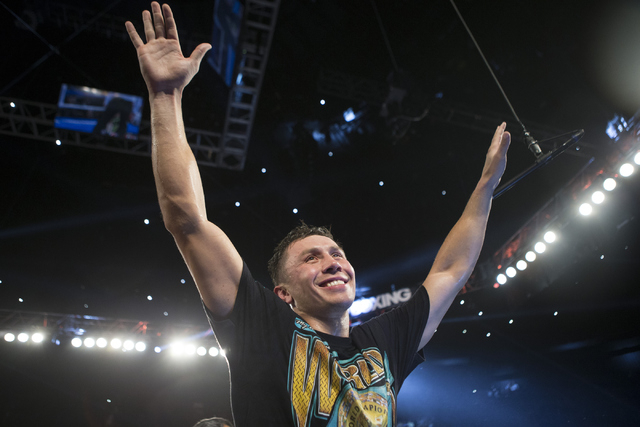 Station Casinos opened Golovkin as a minus-400 favorite in boxing’s next potential megafight. By popular opinion, Saul “Canelo” Alvarez is becoming the face of boxing. He has youth and an impressive record on his side. He also says he has no fear. But, in the opinion of oddsmakers, maybe he should fear a fight with Gennady Golovkin. It could be so big, there is a betting line posted before the fight is made. Station Casinos opened Golovkin as a minus-400 favorite over Alvarez. The betting limit is $20,000, and the bout must go off by Dec. 31 for action. Alvarez (47-1-1) picked up his 33rd knockout win on Saturday, when he flattened Amir Khan in the sixth round to retain his World Boxing Council middleweight title. His popularity is soaring after his triumph at T-Mobile Arena. Golovkin, 34 and nine years older than Alvarez, is 35-0 with 32 knockouts. In April, “Triple G” knocked out Dominic Wade in the second round in Inglewood, Calif. Golovkin never has fought in Las Vegas, and if he faces Alvarez, there is speculation it could be staged in Los Angeles or Arlington, Texas. Alvarez recently said he’s willing to fight Golovkin at 160 pounds, but Alvarez’s promoter is Oscar De La Hoya, who will try to protect his star from a potential fall. Boxing is finally overcoming the hangover from last year’s Floyd Mayweather Jr.-Manny Pacquiao pillow fight. The eyes of the world were fixed on a long-awaited showdown that turned out to be a letdown, with Mayweather winning an easy decision. Mayweather, now in retirement, is talking up a possible comeback against Conor McGregor of the Ultimate Fighting Championship. But that’s a carnival promotion that would not benefit boxing or the UFC, and it never will happen. There seems to be little demand for a Mayweather-Pacquiao rematch. Mayweather probably wants no part of Golovkin. A Mayweather-Alvarez rematch would spark interest, after Mayweather dealt Alvarez his only loss in September 2013. At this point, it’s obvious which matchup packs the biggest punch. Cokin (SmokinCokin.com) said oddsmakers are right to make Golovkin a 4-1 favorite, and Alvarez will draw his fair share of public action at a plus-300 price. Will Canelo Alvarez face Golovkin?